To achieve an efficient network, P-NET specifies rules for bus traffic timing. When a P-NET device sends out a request, the response must arrive back within a specified time. Delays in the transmission are created by the signal propagation time in the cable and delays in repeaters and conversion from cable to Light-Link. Only communication between devices on the same logical bus is affected by such time delays. As soon as the signal is routed through a multi-port device, a new logical network is reached. A delay is measured in “bit times”, Tbit. A Tbit is the time used to signal one bit on the bus. With a communication speed of 76.8 kbit/s, a Tbit is equal to 13μSec. – Between any masters: 2 Tbit. – Between any master and slave: 6 Tbit. If a logical network contains only 1 master (Single master system), the maximum delay from the master to any slave on the network is 6 Tbit. If a logical network contains more than 1 master (Multi-master system), the maximum delay between any two masters is 2 Tbit, and the maximum delay between any of the masters and any slave is 6 Tbit. Each 125 metres of bus cable adds 0.1 Tbit. Each repeater adds a delay of 1 Tbit. (200/125)*0.1 + 1 + (300/125)*0.1 = 1.4 Tbit. Each conversion between P-NET RS485 and P-NET Light-Link adds a delay of 0.75 Tbit. Light-Link cable and Light-Link modules do not add any significant delay. (200/125)*0.1 + 0.75 + 0 + 0.75 + (50/125)*0.1 = 1.7 Tbit. 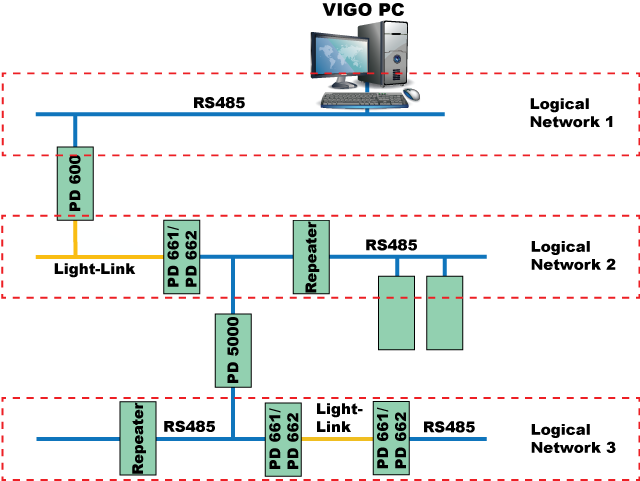 When using a redundancy P-NET installation, it is essential that both RS485 networks are symmetrical with respect to delay. The maximum delay asymmetry of the two redundant networks is: 0.5 Tbit. The difference in the length of the two redundant network cables must not exceed 600 metres. In a multi-master system; no more than 1 Light-Link section and 600 metres of cable is allowed between any 2 masters. A bit time is the time used to signal one bit on the bus. With a communication speed of 76.8 kbit/s the bit time is equal to 13 μSec. Effective signal speed = 225,000 Km/s. 1200m produces a delay of: 1.2 / 225,000 = 5.3 uS ~ 0.4 bit time, in each direction. 1200m total delay = 0.8 bit time (request delay + response delay). Effective signal speed = 198.000 Km/s. 1200 m adds a delay of 1.2 / 198,000 = 6.1 uS ~ 0.5 bit time, in each direction. 1200 m total delay = 1 bit time (request delay + response delay).